It's almost showtime for the City Council at-large candidates forum but just in case you thought there was any plan to do anything BUT go after Ravi Bhalla in this election cycle, two important updates for your consideration. Is there any doubt what the Hoboken municipal race is boiling down to November 5th? If you are still uncertain, here's Beth Mason's political operative Barry Brendel, a seasoned professional across New Jersey elections who returned to Hoboken Wednesday night for one expressed purpose: shoot Ravi! That's right, camera in hand the Mason operative was spending an inordinate amount of time filming Ravi Bhalla and ONLY Ravi Bhalla. 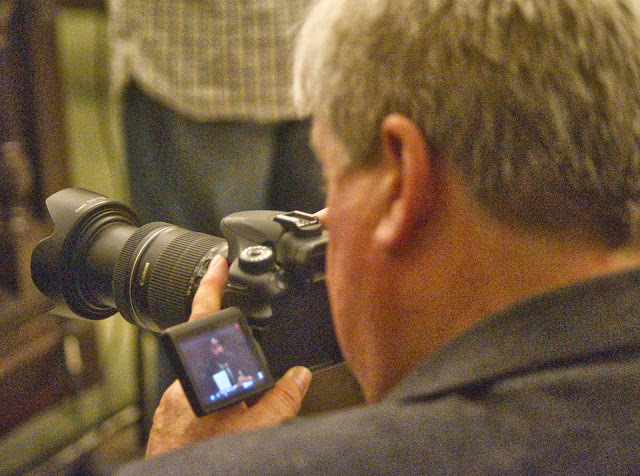 Here's a photo of him filming Ravi Bhalla exclusively as Ramos campaigner David Liebler unleashed a volley against Timmy Occhipinti complaining about buying votes illegally with vote-by-mail. Barry Brendel only has eyes for Councilman Ravi Bhalla. Expect a late breaking commercial on Hoboken411! Talking Ed Note: Previously, Tim Brendel has also filmed at City Council, Hoboken Zoning Board and BoE meetings for Councilwoman Beth Mason where footage in commercials would find their way to Hoboken411. None dare call that "blogger" problematic even with its iron-fisted censorship backed to the hilt by Beth Mason and the Old Guard! Will Hoboken be seeing a cable commercial on TV and aired at the cybersewer Hoboken411?